Having quality tools in the kitchen really, really helps. I cannot overstate this. You can cook on a beaten down pan that’s been handed down in your family for generations if you want. It’s much easier, however, to cook on something that’s new, well cared for, and designed for the task you’re using it for. There are many examples of tools you shouldn’t go without. Chef’s knives are an obvious example, of course, but the next most obvious one is a non-stick frying pan. 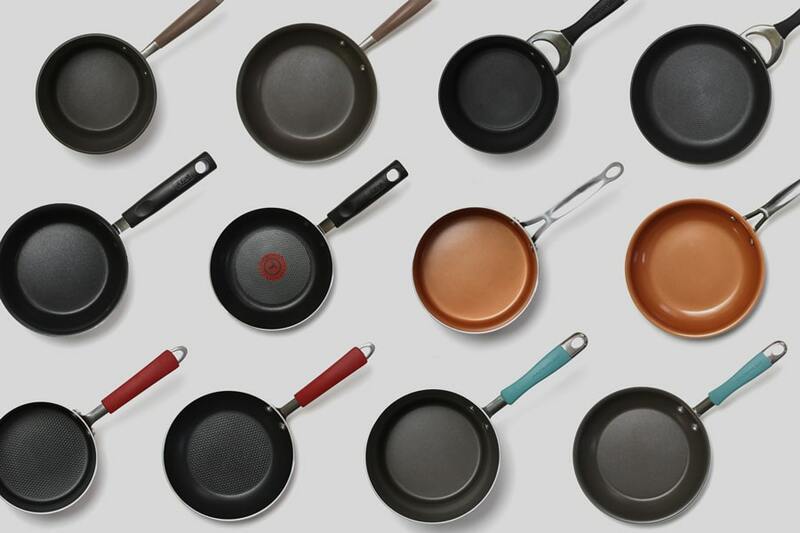 No matter how much you love your cast iron or stainless steel cookware, non-stick frying pans are absolutely vital when it comes to preparing eggs and a handful of other dishes. You can use a pan that you’ve carefully seasoned or meticulously control the heat to keep your eggs from sticking, or you can just crack them into a non-stick pan, walk away, and flip them over whenever you want with zero problems. Gotham Steel and Red Copper are both famous for their frying pans. 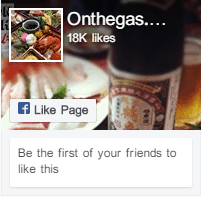 They advertise these products heavily on TV and work hard to get them into stores near you. Both brands claim to use revolutionary techniques to make frying pans that are more effective, more durable, and more non-stick than the competition. But are they? Let’s put these claims to the test. First, let’s talk about what these pans and pots are made out of. Both Gotham Steel and Red Copper make aluminum cookware with a ceramic non-stick coat. The exteriors are (painted) hard anodized aluminum. Pots and pans have stainless handles and sometimes come with matching glass lids with steam vents. This is all pretty standard stuff. 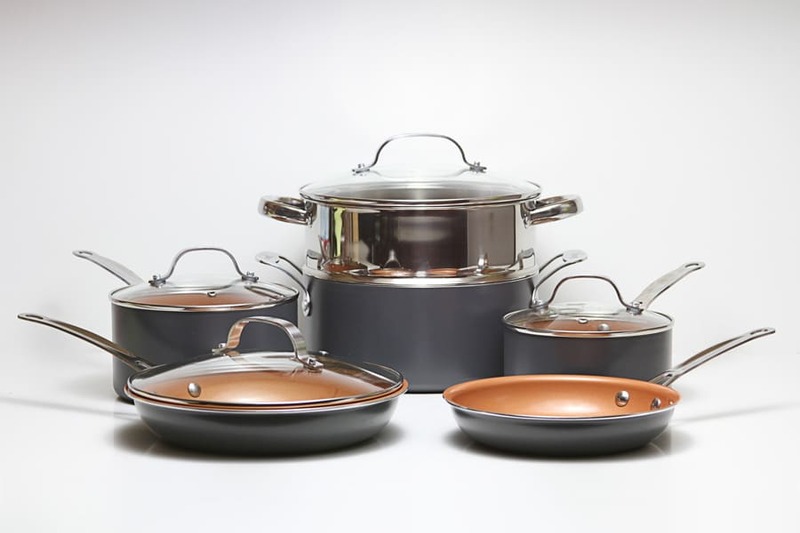 You can find cookware with similar characteristics from many brands, including Anolon, Calphalon, All-Clad, and T-Fal. While these choices may be very standard, they’re also very solid. 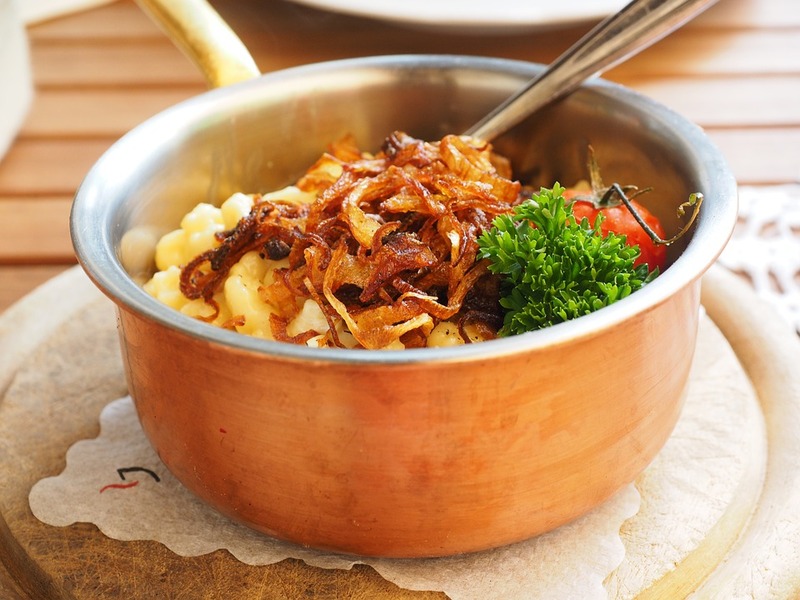 For starters, the aluminum construction means that the cookware is very light. It also conducts heat very well, since aluminum is one of the best materials for transferring thermal energy. 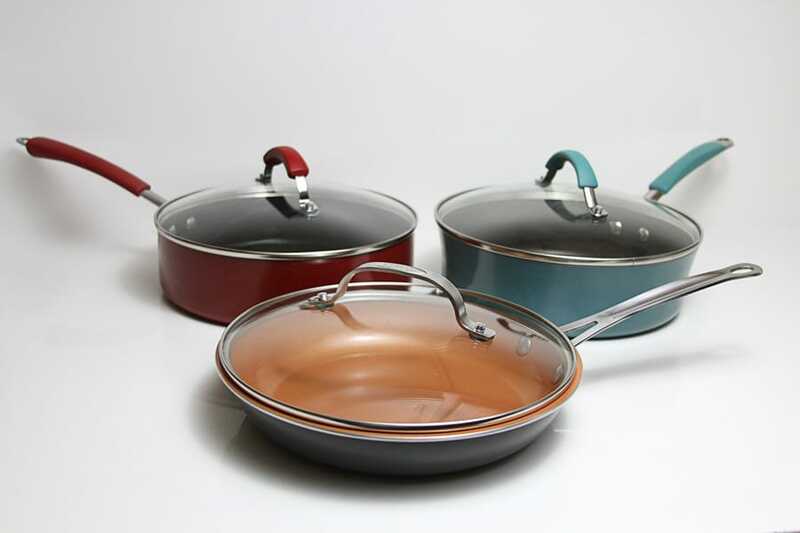 The anodized exteriors are non-reactive and easy to clean, while the stainless handles ensure that these pots and pans are oven safe to a very high temperature. Glass lids are also quite nice when you’re cooking since you get to see your food. Most pieces made by Gotham Steel and Red Copper aren’t induction compatible. You can find a few pieces in some sets that are, but if you’re after induction compatible non-stick, you’re much better off with something like NuWave Duralon or another brand. Is There Copper In Red Copper / Gotham Steel Cookware? 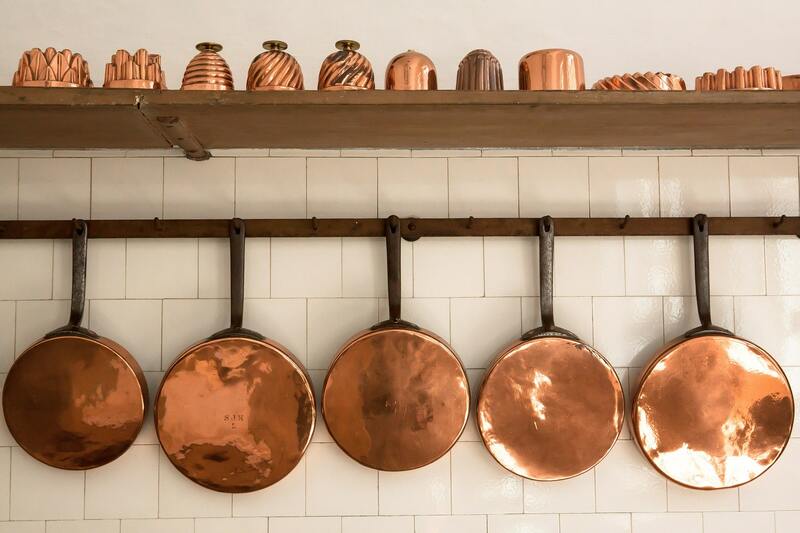 It’s worth noting that while copper is a material that’s highly sought after in cookware, it’s not a primary material in either Red Copper or Gotham Steel cookware. 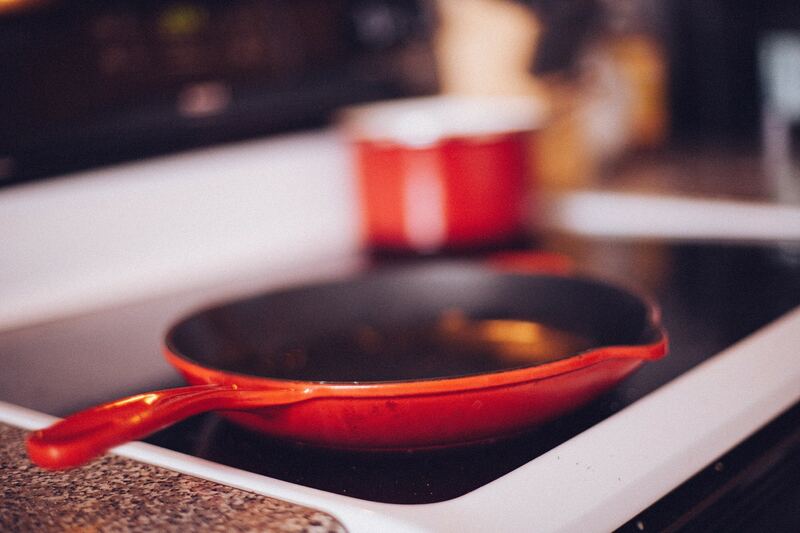 Red Copper uses a small amount of copper in the formulation of its non-stick, but that’s it. Real copper cookware is heavy, expensive, and has even better heat performance than cookware that’s made from aluminum. Red Copper and Gotham Steel cookware is light, cheap, and has fairly standard thermal conductivity. As far as non-stick is concerned, the ceramics used in both of these brands are very similar. You shouldn’t worry too much about the “copper” or “titanium” that infuses the ceramic non-stick. Both brands have nearly identical non-stick properties and nearly identical scratch resistance. Both Gotham Steel and Red Copper use a safe ceramic nonstick. This means that the pans are totally free of PTFE and, more importantly, PFOA. This means that you don’t have to worry about getting toxic chemicals in your food. More importantly, both brands make cookware that’s totally safe well past normal cooking temperatures, which can be a problem with some non-stick coatings. 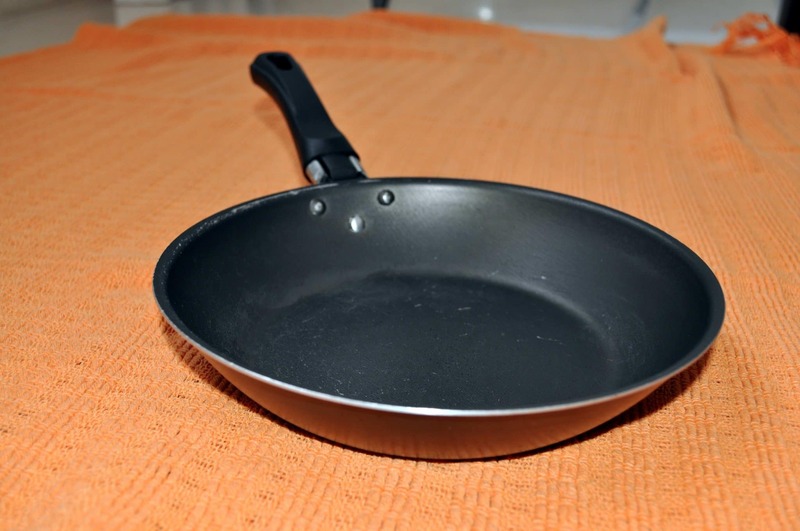 You might damage your pan if you leave it unattended on a hot burner, but you won’t release any poisonous gases. The truth is, Gotham Steel and Red Copper make fairly low-end pans. They’re not particularly scratch resistant and the non-stick has a fairly short lifespan. While the non-stick coating is effective, it’s not as good as something like Thermolon or even traditional Teflon, at least in my opinion. It is, however, identical between the two brands. It may have a slightly different formulation, but both brands give the same odd care instructions (you’re supposed to “season” the pans with oil, not unlike you season cast iron), they both have the same weird performance quirks, and they have nearly identical lifespans. You shouldn’t use the non-stick coating as a factor when you’re comparing Gotham Steel and Red Copper. Should You Buy Red Copper/ Gotham Steel? So why should you buy Red Copper or Gotham Steel? Because both brands are pretty cheap. Even the best non-stick pot or pan has a fairly short expiration date due to the way the materials work. The more you cook, the faster you’ll wear out your cookware. Picking up a Gotham Steel or Red Copper piece means that you can use a cheap pan to cook your eggs and save your more expensive stuff for other tasks. When your cheap frying pan dies, it’s not a big deal: you can just buy another one. Are Gotham Steel and Red Copper The Same Thing? The pans are made by different companies and advertised as having different types of ceramic non-stick. At the end of the day, though, if you put a pan from each company side by side, you’ll notice more similarities than differences. The handles are the exact same shape and size. The interiors feel very similar and have identical care instructions. The big differences are mostly in color, from the shade of the interior to the exterior color. There are also some differences regarding the bottom of the cookware, but that’s simply because Gotham Steel puts their logo there and Red Copper doesn’t. Most importantly, the pans perform exactly the same. There’s no clear winner here: if you notice a difference from one brand to the other, it’s probably because one pan is old or poorly cared for. If you were to do a blind cooking test between these two brands, you’d be totally unable to choose a victor. This isn’t a bad thing: it gives you, the consumer, more choice. 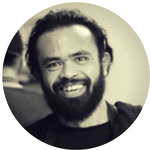 You’re free to choose a brand based on minor cosmetic differences, price, or other factors. If you’d like to read about some of these factors, check out our product reviews on this page. If you’re thinking about buying some Gotham Steel or Red Copper cookware, here are some detailed reviews to help you choose. When you want a full cookware set, this 10-piece collection comes with pots and pans of all sizes and a steamer insert. It’s available in 4 colors (black, copper, graphite, and red) and comes with stylish glass lids with steam vents to prevent your pots from rumbling as you boil water. Like other Gotham Steel products, this cookware set is made from anodized aluminum and has a ceramic non-stick interior. The handles are made from steel to ensure oven safety to a full 500 F. This gives you the ability to transfer dishes from your range to the oven and vice versa without any concerns. The non-stick coating is fantastically effective, especially for cooking eggs and other sticky dishes. You’ll have a lot of fun when you open up this set cooking your favorite foods and having practically no cleanup. Be sure to follow the manufacturer’s instructions and use low heat, a bit of oil, and a properly seasoned pot or pan. The biggest downside to this set is the lack of durability. The particular formulation of ceramic non-stick used in Gotham Steel products seems to last for less time than other ceramic non-sticks, both in terms of stickiness and in terms of scratch resistance. This can be pretty nasty if you’re not expecting it, of course, but if you’re getting a cheap, temporary cookware set it’s not a big deal. After all, even the best Teflon or Thermolon coating will only last for a couple of years. Truthfully, if you’re looking for a big difference between this and the similar Copper Pan set, there isn’t one. Both sets have the same contents (down to the steamer insert). They’ve got similar lids, similar materials, and similar performance. The largest difference is probably the color. If you want a cheap, effective non-stick cookware set, this is a pretty solid choice. Don’t expect to hand it down to your kids, though, unless they’re moving out within a year or so. This is a single Gotham Steel pan, perfect for doing your daily morning cooking. Like the pieces in the cookware set above, it’s fantastically nonstick and cheap but not particularly durable. These qualities mean that it’s probably best purchased in the pack of two. Simply store one of your pans in a cupboard somewhere so that when the first one dies, you’ll have a backup ready. As far as an egg pan goes, though, you’re hard-pressed to beat this Gotham Steel tool. The non-stickiness is pretty impressive, and it’s coupled with the fantastic heat distribution of aluminum. Combine this with the fact that this pan is incredibly cheap and doomed to fail anyway and you get a pan that you don’t mind being rough with or throwing in the dishwasher. It might sound like I’m being pretty negative here, so I should take a step back and stress that I think that buying this pan is ABSOLUTELY a good idea. Like, full stop. You can spend four times as much money and buy a pan that MIGHT last for twice as long, or you can buy four of these and not really care about how you treat them. I think that the Gotham Steel option (buying one or more of these and expecting it to fail) is easier, more fun, and more cost-effective. This cookware set is practically identical to the Gotham Steel set above. Other than color, it’s very tough to notice a difference. It has the same pieces made of the same materials in the same shapes and sizes. It has similar, if not identical properties in the kitchen, and it tends to cost a similar amount of money, depending on online sales. To briefly review: this means that it’s fantastically nonstick, especially for the first several months of use. You should still use a bit of oil with this cookware, cook with low heat, and follow the manufacturer’s seasoning instructions. The cookware has glass lids with steam vents and is oven safe (without the lids) to 500 F, which is fairly high. This facilitates easy transfer from one cooking station to the next. Just like Gotham Steel, this set isn’t particularly durable. Despite what the commercials say, it’ll scratch fairly easily. It’ll also lose its non-stick properties over time. 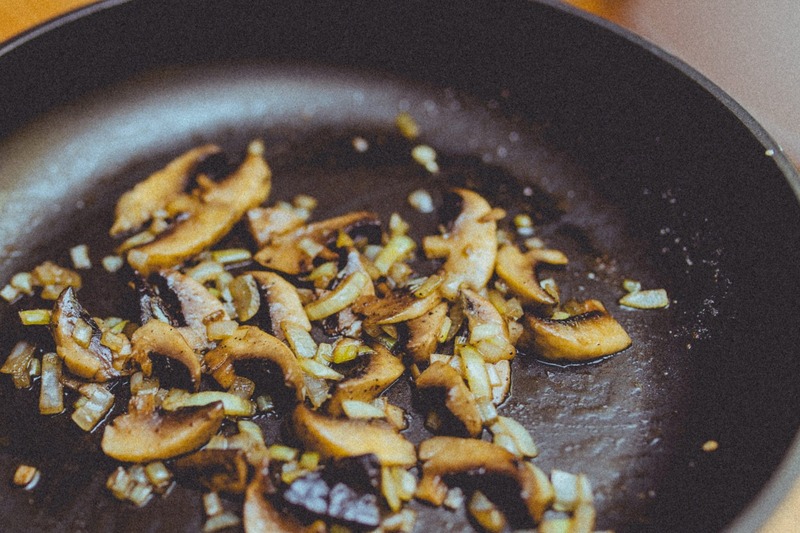 While all non-stick coatings will wear out, this style of non-stick seems to wear out faster than coatings like Teflon or Thermolon. Luckily, the Red Copper cookware set is very cheap, so it’s not a big deal to simply buy a new set when your first one fails. If you’re after a cheap cookware set, this Red Copper set has everything you need (and a steamer insert, which is a nice inclusion). It’s an especially good buy if it’s on sale for less than the Gotham Steel set above. This Red Copper frying pan set has some interesting properties. It comes with two notably deep, square frying pans which are otherwise pretty similar to all of the items reviewed above. The shape is quite interesting, however, since it combines with the high-temperature oven safety to effectively give you two square baking dishes that can double as egg pans when you want to use them on the stove. Honestly, this is a pretty brilliant bit of innovation. I could hardly use my shallow griddle in the oven if I wanted to, but these deep frying pans have walls that are more than tall enough to facilitate me baking cornbread, brownies, or other dishes in them. Like the Gotham Steel pan above, these aren’t going to last for forever. Also like the Gotham Steel pan above, these are pretty darn cheap. Their unique size and shape makes them a pretty attractive purchase, even if you already have a frying pan that you use everyday. At worst, you’ll be able to use these to fry eggs for a while to give your more expensive cookware a break. Gotham Steel and Red Copper make nearly identical cookware products that are cheap and short-lived. As long as you don’t mind replacing your cookware every so often (or buying more than one set at once), they make pretty solid purchases. The easy cleaning and effective nonstick will reduce the amount of time you spend doing food prep and cleaning. If you want something a bit fancier, however, check out one of these cookware brands.